P&G recently announced the STAR and LTIP programs for 2018. These awards can provide significant opportunities to build future wealth and achieve financial goals. 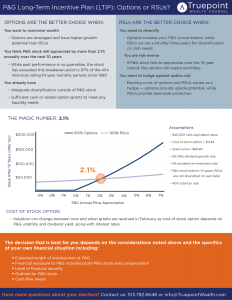 Because both programs come with a choice between stock options and an alternative (cash or RSUs), there are several considerations to be made when determining the most appropriate choice. 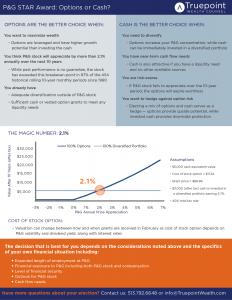 P&G Long-Term Incentive Plan (LTIP): Options or RSUs? P&G STAR Award: Options or Cash?